Thank goodness for my local library. When the Old Book Junkie needs a fix, he knows where he can go. It paid off nicely this past Saturday. I found something I’ve been looking for for quite a while; a volume of the collected stories of Edgar Allan Poe. “Edgar Allan Poe Stories: Twenty-seven Thrilling Tales by the Master of Suspense” (Platt & Munk, 1961) has what most Poe fans would expect like The Telltale Heart, The Pit and the Pendulum and The Murders in the Rue Morgue. But it also has a story called Metzengerstein, about the transmigration of souls (brownie points for those who know the difference between transmigration and reincarnation!) The volume ends with a nice selection of his poetry. I also snagged a copy of “Tozer on the Holy Spirit” (Christian Publications, Inc., 2000). It’s “a 366-Day Devotional” which includes a daily scripture reading, extended passages from A.W. Tozer‘s best books as well as quotes from other authors. This will be a welcome addition to my mornings! One of my favorite Sunday activities is going over the book reviews in the weekend edition of the Wall Street Journal. 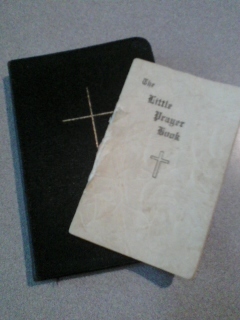 This weekend, however, reminded me of why I prefer older books. It all seems a bit superficial to me somehow. Maybe it was just a slow publishing week. A while back I wrote about my experience writing the foreword to “The Core of Johnny Appleseed”. For those of you interested, here’s a link to the book as it appears in the Christian Bookstore. Go check it out! Communists are that part of mankind which has recovered the power to live or die – to bear witness – for its faith. And it is a simple, rational faith that inspires men to live or die for it. No, I didn’t just misspell a political slogan. The title of this post is a shameless ploy to get your attention so I can share a story with you. I hope this little tale will offer a bit of encouragement, especially to my fellow bloggers out there. If you’re not a blogger, well, you’ll see that blessings can drop into your lap when you least expect it. Back in the middle of June I did a book review of “Better Known As Johnny Appleseed,” by Mabel Leigh Hunt. Two days after I posted it, I received a comment from a gentleman named Ray Silverman, who was working on a new book about Johnny Appleseed. 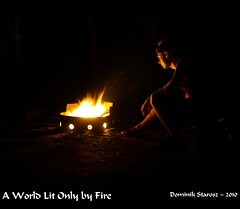 He wrote that he enjoyed my writing and wanted to know if I would like to write the Foreword to his new book. After I ran a virus scan and rebooted my computer to make sure this wasn’t some glitch, I emailed Professor Silverman and told him I’d love to do it. When he received the OK from his executive editor at Swedenborg Foundation Press, my work began. About 850 words and a couple of edits later, I was finished. The photo you see above is an “Advance Sample Excerpt” of the book used to promote it before publication. Amazingly, my Foreword is included in it. So how did Professor Silverman find my review? It seems his editor was surfing information about Johnny Appleseed, came across my blog post and forwarded it to him. Which shows that you just never know who may be out there in internet-land reading your words, and you never know what the next comment will bring. 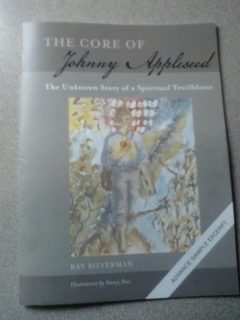 If you have any interest in American history or folklore, I highly recommend “The Core of Johnny Appleseed.” Ray Silverman examines in-depth a side of Johnny that most authors overlook: his faith. While many people know that Johnny was Christian, they don’t know that he was a Swedenborgian, a member of the New Church. In fact, he was one of their greatest missionaries. Professor Silverman is also a Swedenborgian and a teacher of New Church theology. Because of this, he can shed a light into Johnny’s psychology that others simply overlook or willfully ignore. More importantly to me, Dr. Silverman is combating something I call Speculative Revisionism, where an author or historian tries to change the meaning or context of history based on their own speculations. Guesses really. A lot of times this serves no further purpose than to help them sell books or appear on talk shows. A good example of this is another book about Johnny Appleseed recently published in which the author concluded that John Chapman was basically insane and compared him to a homeless person on the streets. His book got great reviews. Again, if you like American history or folklore and wish to read something insightful rather than speculative, I highly recommend you get a copy of “The Core of Johnny Appleseed” by Ray Silverman. It is scheduled to be published this November by Swedenborg Foundation Press in an affordable paperback edition. Dr. Silverman’s writing is clear and straightforward and you will gain insight not only into an American legend but also into a faith that many know nothing about. “The Pantheist’s God does nothing, demands nothing. He is there if you wish for Him, like a book on a shelf. He will not pursue you. . . But God Himself, alive, pulling at the other end of the cord, perhaps approaching at an infinite speed, the hunter, king, husband – that is quite another matter. . . There comes a moment when people who have been dabbling in religion (Man’s search for God”!) suddenly draw back. Supposing we really found Him? We never meant it to come to that! Worse still, supposing He has found us?